Any time you move into a new home, whether it’s been around for a century or was only recently finished, you should always start with a re-keying for all the exterior doors. The reason is a pretty straightforward one: the standard home key can be duplicated really easily. As we discussed in a previous blog, even those “Do Not Duplicate” keys can be copied easily. If your home was previously owned by someone else, there’s no way of knowing how many keys were given to family members, neighbors, or others and not returned. The same thing goes for newly-built homes; the builder will often hand out keys to contractors as the home is being finished, and they aren’t always attentive about collecting the copies. Re-keying the locks on your home changes out the tumbler without affecting the hardware, so all those old keys will become void and you don’t have to worry about finding new knobs or locks that match the previous ones. This scenario is one we’ve all faced at one point or another. On a rushed morning, before the coffee kicks in, it can be really easy to lock the knob from the inside and pull the door shut after you—only to realize your keys are still hanging on the hook inside. Accidents happen, and if you don’t have someone nearby with a spare key, you could be in a bit of a pickle. For the security of your home, we never suggest hiding a key under a planter or rock outside your home. Thieves find those pretty easily. And, unless you have a spouse, family member, or roommate with another key, your only options are to break into your home or call a locksmith. While you’re welcome to try to break into your own home, we don’t recommend it. One problem is you risk the police being called on you for breaking and entering. The other more costly problem is the potential damage you could do to your home. 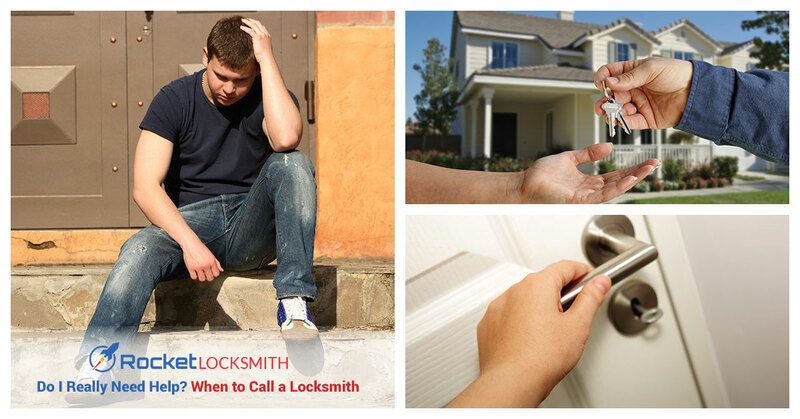 Having a locksmith come unlock your door for you is going to be a lot less expensive than replacing your broken door. We can also come out and install a keyless entry system, if you find you lock yourself out frequently or just want to ditch your house keys. Keys can weaken and break after a lot of use. Unfortunately, they often do so while being used in the lock. If your key breaks from something like being dropped one too many times, getting new keys made is a quick and painless process. However, if your key broke off in the door, that’s a bit more complicated. You don’t want to break the lock or get the key jammed further in by trying to pull it out yourself, as you may end up doing enough damage that the lock needs to be replaced. However, your local locksmith has the experience and the knowledge to come out quickly, extract that broken key for you, and even replace the key for you. Rocket Locksmith can do all this and more! If you need locksmith help in St. Louis, contact us today to schedule service or get emergency locksmith help!